Mueller-Korenek, a 45-year-old national champion cyclist from Valley Center, north of San Diego, set the new record for fastest speed riding in a slipstream. 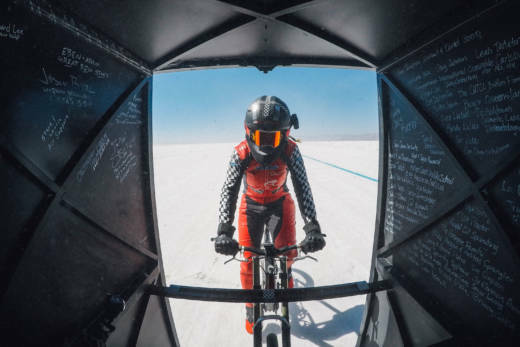 She teamed up with Shea Holbrook, a professional race car driver who piloted a dragster that led the cyclist across the Bonneville Salt Flats in Utah. "Good job, Mom," Mueller-Korenek's son, Daniel, said in a video he recorded as he joined his mother in the finish area on Sunday. "That was rough," she said. In addition to getting bounced around at speeds only supercars can aspire to, Mueller-Korenek said the salt dust had entirely coated her throat. The dragster has fairing on the back that essentially looks like a closet, to protect the cyclist from the wind. Behind it, Mueller-Korenek sat on a bike with gearing so steep that she needed to be towed to around 100 mph before taking over under her own power. The tow rope was released some 1.5 miles into the run, Mueller-Korenek said on Facebook, "leaving 3.5 miles in the draft to achieve an average speed for the last mile of 183.9mph (between mile 4 & 5)!" Once they finished that phase of the run, the danger of a calamitous fall wasn't over: Holbrook and Mueller-Korenek had to work in tandem to slow down some 70 mph over a final mile, to reach an exit speed of 110 mph. The feat may cause Guinness World Records to changes its categories, which currently separate bicycle speed records by gender. Mueller-Korenek had previously set the women's speed record on a bike, with a mark of 147.74 mph in 2016. For that effort, Holbrook was at the wheel of a highly modified Range Rover. From her teenage years, Mueller-Korenek was a champion cyclist. She had top-three finishes more than a dozen times at the national and world levels. But she retired early from that career, leaving competitive racing to run a home security business and start a family. She set her sights on speed records a few years ago, after reuniting with John Howard, her former coach who had himself gone from being a decorated cyclist to racing behind dragsters, some 30 years ago. As they targeted the overall record, their team revamped the same dragster that was used to set the men's record. Dutch cyclist Fred Rompelberg, the now-previous record holder, had gone 167 mph behind the car in 1995. Mueller-Korenek and Holbrook obliterated that record this weekend, with a gripping ride during the World of Speed event held at the Salt Flats. "The ride of her life and the drive of mine," Holbrook said in an Instagram post about the feat. Celebrating the successful record attempt, Holbrook shouted, "Where's our margarita? We have the salt." Moments after the run, the news that she had obliterated the land speed record for a paced cyclist drew a stunned response from Mueller-Korenek — who also noted that it was a higher speed than they were supposed to aim for. "Oh shoot," she said in her son's video. "We weren't supposed to go more than 175. Well, we aren't going to be let back out, probably." "I think we broke the limit of what we were supposed to do," she told Holbrook later, laughing as she hugged family members, friends and support staff. As she and Holbrook embraced, Mueller-Korenek added, "You had to go for it." Moments later, Holbrook yelled out into the open air of the Salt Flats, "Beat that, Fred!"